In many occasions like parties, holidays, weddings or family reunions, we need a place where to collect everyone’s memories from the event, like photos and videos. 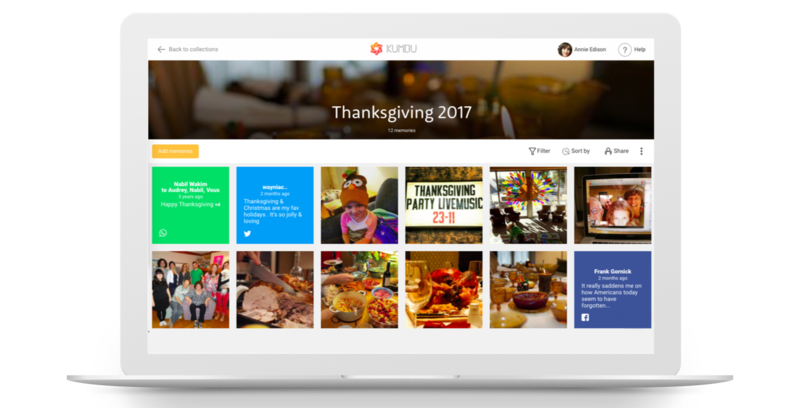 Kumbu now allows you to build collaborative collections of photos, videos and other memories for you to share with your friends and family. Everyone will be able to view and enjoy these beautiful and happy memories! Kumbu - the Souvenir Box for the Digital Era - is a safe place where to keep and enjoy all your digital memories: photos and videos, but also Facebook posts, Instagrams, WhatsApp conversations and many more. Whenever a special occasion happens, or if you simply want to collect and share memories with each other, simply create a Kumbu collection. 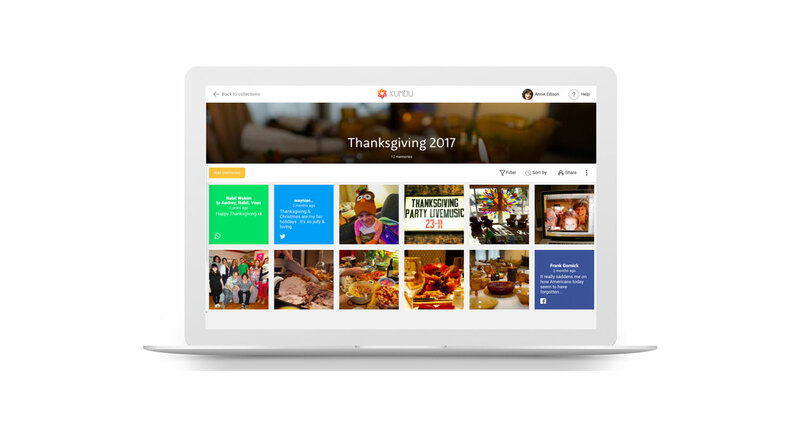 Invite a group of people to contribute to your collection and upload their memories: your folks can easily share photos and videos without having to create an account. No signup is required to upload photos and videos, yet Kumbu registered users can benefit from the Kumbu Save Button for Chrome or Firefox to save memories directly from the web and social networks (Facebook, Instagram...). Kumbu is a secure and privacy respectful place where your memories remain private. Only the people you share the collection with will be able to view the memories. Whenever needed, you may stop sharing and revoke access. The owner of the collection must be a registered user. But contributors may upload photos and videos without signing up. 2. Add memories, or do it later. Upload photos and videos from your device. Collect memories from the web and social networks using the Kumbu Save Button for Chrome or Firefox. 3. Click Invite in the navigation bar. 4. Enter 1 or more email address to send invitation(s). No ads, no data sold, no spam: your group’s emails are neither shared or sold with third parties. Contributors should click the link provided in the email to view the collection and the memories. To upload photos and videos to the collection, contributors must hit the Add memories button. Visit our website and the product section of our blog to learn more about Kumbu - the Digital Souvenir Box.